When hitting the retail card aisle, collectors are presented with a number of options: blasters, rack packs, loose packs (and some other configurations I can’t remember). You might think that because these cards are found in the same place, made by the same company, and are the same brand that they are the same, but not all retail products are made the same. I was looking through the card aisle (with Marie) and we were talking about cards. We looked at the dozens and dozens of blasters sitting on the shelves and I made a remark that I wouldn’t go for a blaster and opted for rack packs instead. That’s when I flipped the packs to their backs to show how the odds were different. For a rack pack of Opening Day (which comes with 24 cards and three inserts), the odds were much easier to pull something – anything. Inserts were 1 in 2 packs with relics and autos being tougher pulls than that. On the blaster, the inserts were 1 in 4 packs. Based on price, total cards, and odds, what do you think is the best option? Only problem with rack packs are the y are most assuredly "searched" before you get to them. I have never had issues with rack packs being searched. Loosies is where all the problems are for me. While the total number of inserts is highest in the loose packs (and price-per-insert is the lowest), if you're trying to build a set by opening packs you're better off with the blaster. The odds of pulling an autograph in a blaster are (about) 1:40, relic 1:39, and mascot autograph 1:79. But for about $10 the odds with 3 rack packs for autographs are (about) 1:27, relic 1:27, and mascot autographs 1:54. I would probably go with three rack packs, just for the hope of getting a good sample card from each of the insert sets. Someone has been searching all the packs at my local Targets, Wal-Marts, and Fred Meyer's. I can tell because I've a) run into the guy on a number of occasions and b) the packs are always taken out of the boxes and put back in sideways after being searched. And the rack packs have their cards pushed against the edge of the pack in a certain way. You can tell they've been manipulated. best option is to wait and buy the singles you want from the suckers who busted the wax in the first place. 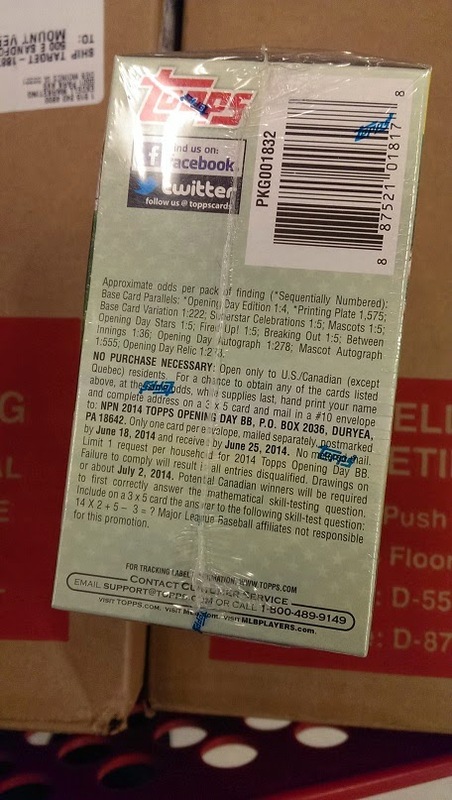 Is Topps taking care of redemptions? Which Chuck Finley am I really collecting?